Bryan Allen scored with 2:14 left in overtime to help the Florida Panthers rally from an early two-goal deficit to beat the San Jose Sharks 3-2 on Saturday. After becoming the first team in NHL history to win three straight games in regulation when trailing after two periods, the Sharks found themselves on the other side of a late comeback. Shawn Matthias scored the equalizer off a spin move about 5 minutes into the third period and then set up the game-winner in overtime for Florida. Matthias beat Joe Pavelski on a face off and then went to the front of the net to set a screen for Allen, whose shot from the point beat Thomas Greiss. San Jose came out on fire in this game. They were up 2-0 17:45 into the game and I was expecting an ugly result. It didn’t happen. San Jose may have been overconfident. First because Florida isn’t that good, then they haven’t won in San Jose, the Sharks most importantly are one of the best teams in the NHL. 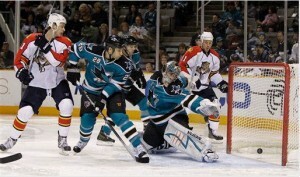 All this said, the Panthers managed to beat the Sharks during the 2008-09 season. San Jose instead of playing their ace Goalie Evegeni Nabokov, sent out Thomas Greiss who hadn’t played in over a month.. Florida Panther Billy Lindsay calls Greiss a terrible puck handler. He looked like it tonight. I think San Jose expected an easy win. They didn’t get it because Florida didn’t give up. Keith Ballard scored in the 2nd period, while David Booth and Bryan McCabe came tantalizingly close to more goals. In the third period, Shawn Matthias put in his 6th goal of the season. After early difficulties, Vokoun ended up stopping 37 of 39 shots on goal. The game went to overtime where Matthias and Allen combined on the winning goal. Sadly I still don’t think Florida will make the post season. This win was thrilling but essentially part of a play that has little meaning barring a miracle. Next up for Florida- Washington on Tuesday. The other team besides San Jose that I picked to make it to the Stanley Cup Championship. Florida hasn’t beaten the Capitals once this season.